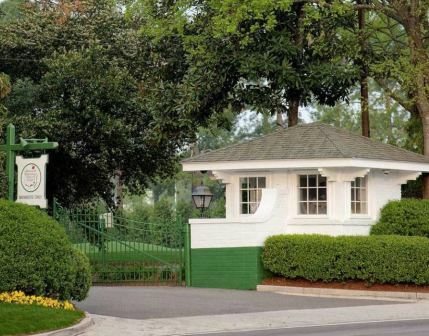 Augusta National Golf Club -Eighteen, is a Private, 18 hole golf course located in Augusta, Georgia. Upon his retirement from championship golf in 1930, Bobby Jones had hoped to realize his dream of building a golf course. 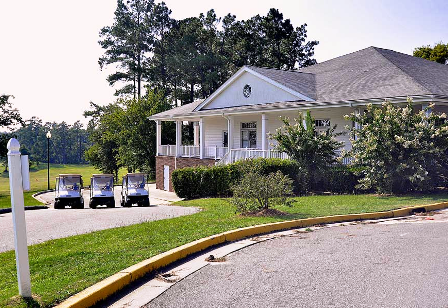 He realized that dream with the construction of a course in Augusta, Georgia. And the rest is history as they say. That course is Augusta National. Augusta National construction began in the first half of 1931 and the course opened in December 1932 with a limited amount of member play. Formal opening took place in January 1933. Alister Mackenzie of Scotland served as the course architect. Bobby Jones consulted with Mackenzie on the design. Mackenzie died in January 1934, two months before the first Tournament. Hole #1, (Tee Olive) Par 4, 455 yards. Dogleg right that plays uphill. Hole #2, (Pink Dogwood) Par 5, 575 yards. Dogleg left. Fairway bunker on right comes into play. Green guarded by two bunkers in front. Hole #3, (Flowering Peach) Par 4, 350 yards. Tricky green that slopes sharply from right to left. Hole #4, (Flowering Crab Apple) Par 3, 240 yards. Long iron for power hitters, others will use fairway metals. Deep bunker protects right of green. Hole #5, (Magnolia) Par 4, 455 yards. Beware the deep fairway bunkers! Hole #6, (Juniper) Par 3, 180 yards. Elevated tee shooting to a generously sized green. Hole #7, (Pampas) Par 4, 450 yards. Narrow fairways guarded by Georgia pines. Green surrounded by 5 bunkers. Hole #8, (Yellow Jasmine) Par 5, 570 yards. If the distance is not enough, remember it is up-hill. Avoid the fairway bunker on the right. Green tucked to the left. 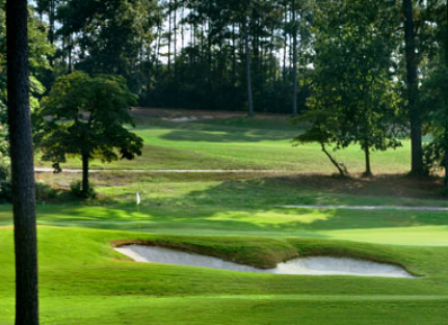 Hole #9, (Carolina Cherry) Par 4, 460 yards. Hit tee shot right for good angle to the green.  Do not leave your approach to the green short or ball will roll back in your direction. Hole #10, (Camellia) Par 4, 495 yards. Catch the slope in the fairway and you shorten the hole. Scores show this to be the most difficult hole. Beware. Holes 11/12/13, This portion of the course is known as Amen Corner. Named so because this is the location where critical action often takes place. 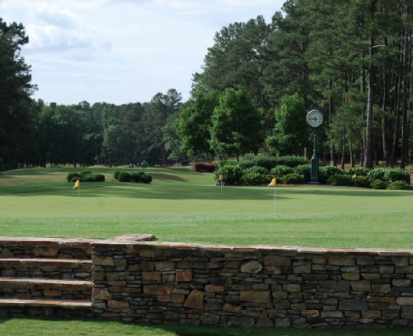 Rae's Creek cuts across the Southeast corner of Augusta National. The creek runs along the back of the 11th green, in front of the 12th green, and ahead of the 13th tee. The Hogan and Nelson Bridges cross the creek after the 12th and 13th tee boxes. Hole #11, (White Dogwood) Par 4, 505 yards. Fairway tighter than in previous years. A middle fairway shot sets you up for a green in regulation. Easy game. Hole #12, (Golden Bell) Par 3. 155 yards. Gauge the wind correctly, fly over Rae's Creek, and land softly on shallow green. Then just putt. Hole #13, (Azalea) Par 5, 510 yards. Fly over the trees and aim for middle of the green. This sets you up for a good line to the green. A branch of Rae's Creek is still a consideration as it winds in front of the green. Hole #14, (Chinese Fir) Par 4, 440 yards. Wow, no bunkers. What's the catch? A green with wicked contours feeding the ball to the right. Hole #16, (Redbud) Par 3, 170 yards. Hole plays entirely over water. Green slopes from right to left. Bunkers on the right of green. Of course. Hole #17, (Nandina) Par 4, 440 yards. Eisenhower tree, 210 yards from the tee box. Eisenhower never missed it, you should. Green protected by 2 bunkers. Hole #18, (Holly) Par 4, 465 yards. The last hole before winning a Green jacket! Actually I played Augusta National in 1996. My good fried Lou, a member at Augusta for over 30 years, invited three of us to join him for four days of golf and companionship. We arrived at noon on Sunday and after being shown our quarters for the next four days, Mammie's Cabin, we hit a few shots and went on the play what, from my point of view, is the most extraordinary golf course on this planet. That first day I three putted seven times but as I played on I got better at understanding the greens. As a golfer, I felt like I had died and gone to golf heaven. What a wonderful experience. The kind that lives with you a lifetime. Makes you realize that some things on your bucket list mean more to you than others.